I waited 3.5 hours in the hot 110 temperatures today for a towing company (SDL) who told me it would be 2 hours before they could arrive at my place where I was stranded. SDL then phones me at the original ETA saying they would be another 40 minutes delayed. Mobile Maintenance was called and within 10 minutes arrived to tow my car to its destination. Ricky Johnson was efficient, friendly, and empathetic to my horrible experience waiting 3 hours in the hot sun for SDL to show up. 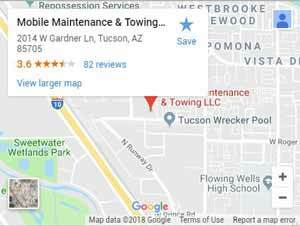 Thank you Ricky and Mobile Maintenance Towing. You’re the BEST! Al was sent out by Geico to tow my car to AutoNation Honda. He arrived right on time and was friendly and polite. He double checked to make sure my car was front wheel drive before hooking it up to tow it and then quickly got it set up. I got to wait in his very comfortable and clean and air-conditioned truck.